Cited by Delaware Today magazine as among the outstanding practitioners in her field, Jill’s clients and peers have praised her for being "trustworthy and personable." 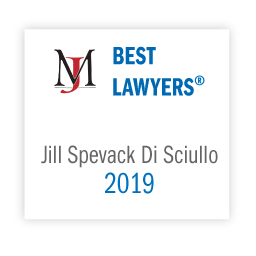 Jill Spevack Di Sciullo has over fifteen years of experience and is a member of Morris James’ Family Law Group, ranked as the premier group of practitioners handling domestic relations matters in Delaware. Jill represents clients in all aspects of domestic relations matters. Jill has represented clients in complicated property division matters involving dividing businesses and various other types of property. Jill has represented clients in adoption matters, as well as drafting and negotiating premarital agreements. Jill also represents clients in custody and child support matters. Jill represents clients throughout Delaware, New Castle County, Kent and Sussex counties. Delaware Adolescent Program, Inc. ("DAPI"), Chair, 2017 - Present. Previously served on the Board of Directors and as Secretary.